The 2013 ASME “International Technical Conference and Exhibition on Packaging and Integration of Electronic and Photonic Microsystems”, aka ”InterPACK 2013” is just concluding in San Francisco. As the conference title implies there are papers and presentations from all over the planet that are focused on research into improving electronics, computers, and data centers. One of those papers presents results from an on-going research project that Mestex has started with the College of Engineering at the University of Texas at Arlington. This research project will likely go on for a couple of years and this paper presents some of the first findings that are being used to establish a “baseline” for the rest of the research. The paper is listed in the proceedings as “InterPACK2013-73302”. The human-readable title is “CFD MODELING OF INDIRECT/DIRECT EVAPORATIVE COOLING UNIT FOR MODULAR DATA CENTER APPLICATIONS” and the paper covers exactly what the title suggests. 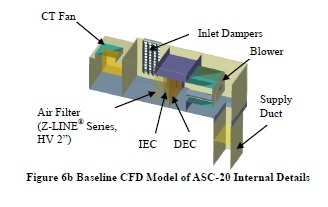 The IDEC product that the paper covers is the Aztec ASC-20 and the goal is to establish that the factory data that we present in our literature can be validated against a detailed CFD model of the product. By modeling the Aztec ASC-20 components and creating the 3-D CFD model using factory dimensional drawings the researcher was able to confirm that the published factory data is accurate and the ASC-20 will perform as predicted based upon the operating parameters. This important result can be used to further our research into optimizing the performance of evaporative cooling and fresh air cooling solutions for mission critical/data center applications. A full scale modular data center mock up is being installed at the Mestex facility and additional documentation and validation of the performance will be conducted over the next several months. The CFD baseline model will be used to simulate filter performance and airflow changes prior to making the physical changes to the research module. The Aztec, and Alton DEC, evaporative cooling products have been used in the industrial and large commercial market since 1946. Over those 66 years the products have been refined and optimized. This research project will take the product lines to another level of thermal performance, water use optimization, and control software optimization with a specific emphasis on the needs of the mission critical market.